Mequon developer Cindy Shaffer is set to start construction next month on her Spur 16 town center project on Mequon Road, and announced St. Paul Fish Co. will have a restaurant there. The 14-acre project at 6200 W. Mequon Road will include 156 apartments and townhouses, and Shaffer would rehab three existing buildings on the site into commercial space, including a public market. 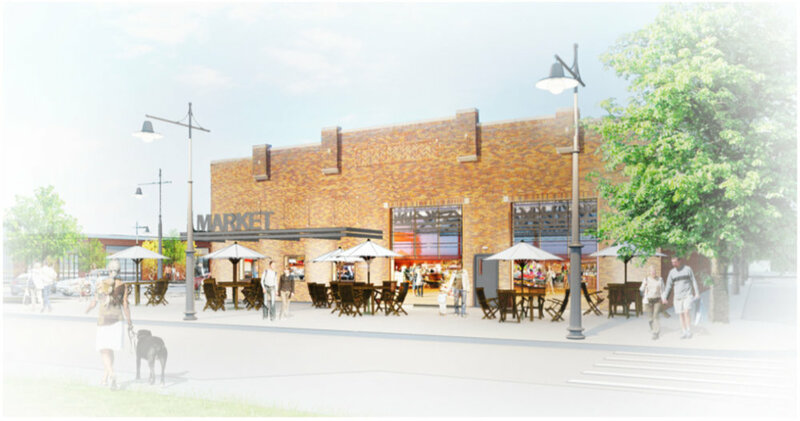 Tenant announcements for that public market are expected in the coming months, according to a Friday announcement by Shaffer Development LLC. St. Paul Fish Co.’s restaurant will have seating for 200 people, an oyster bar and a fish market. St. Paul’s stand is currently a staple at the Milwaukee Public Market at 400 N. Water St. in the 3rd Ward. “We like the developer and we like the building and we like the area,” said owner Tim Collins. St. Paul Fish would move into the rehabbed brick building featuring a tall smoke stack on the southeast corner of the site. Construction work is to start in February on the apartments, which will be in a trio of three-story buildings on the north end of the property, and commercial building renovations. The commercial buildings will be complete in summer. The project also includes 10, two-story townhouses. The first of those will be complete in fall. “We already have reservations on two of our 10 town homes that will be located along Buntrock Avenue and we have not started marketing the project,” Shaffer said. Shaffer first proposed the development in spring 2016, and has been working to secure approvals to buy the 14 acres from the city. She also is co-developer of the Mequon Town Center at Mequon and North Cedarburg roads. Mequon city officials have been embracing higher density mixed-use projects along Mequon Road. In 2017, the city advanced plans by another local development group for the $50 million “Foxtown” project on 17 acres south of Mequon Road on both sides of Industrial Drive. That project includes a microbrewery, 100 luxury apartments, restaurants, offices and a neighborhood of single-famly cottages.